It’s time to dust off my old trusted Crystal Ball for my third attempt at predicting the future. My past two attempts have made me realize that my powers as an oracle are more than a little on the weak side. I’m not even quite Batman in comparison to Superman. More like Robin. Or maybe Robin’s ex-girlfriend. But, ‘tis the season for predicting, so here goes nothing! In Part 1, I’ll explore the political theatre. In Part 2, I’ll take my predictions on the road, and look at some other issues which are only somewhat political (and not at all theatre). I keep predicting a federal election, and I keep coming up short (both in 2009 and 2010). This year, though, I have to think that I’ll hit the jackpot, despite lacklustre polling numbers for all parties. What’s more telling for me is a recently released poll which suggests that about half of Canadians won’t mind an election in 2011, and only a little over 1/3 against the idea (and most of those are Conservative Party supporters). Michael Ignatieff has said it’s time to pull the plug, and even though he’s “been there, done that” before to no effect, I think that the Bloc and NDP are going to have a difficult time with the spring budget. I say “difficult”, however, and not “impossible”, which is a word that I might have used to describe the budget situation a few short weeks ago. However, since then, Federal Finance Minister Jim Flaherty has been suggesting that the budget might be a little more “stay the course” than “austerity in your face take that sucka” than he had previously been leading us to believe. Stimulus spending, which wasn’t rushed out the door to the Cons up-tempo pace (and which apparently didn’t seem to create much in the way of jobs, which was what this multi-billion dollar expense was supposed to do) will continue to be spent at least during the first part of 2011. Some believe that Flaherty might include a poison pill in the budget, in order to get the other parties to vote against it and defeat the government. That’s possible. Goodness knows that the Conservatives like to throw everything they can into their budget bills, whether it has anything to do with financing or not. We’ve seen environmental legislation gutted by a budget bill in the past. Why not pick on something else? But I’m not 100% on a spring election, because the Conservatives polling numbers just aren’t as strong as they might be. While I’m sure that the Cons believe that they can increase their numbers during a campaign in which they’ll unleash the most negative attack ads ever seen in Canada against Liberal Leader Michael Ignatieff (which will be successful), they just might not feel that they’re “there” yet. However, dawdling on the election might put the Cons into some hot water. Have you checked out the price of oil lately? At the pump here in Sudbury, it’s up to almost $1.20 a litre this weekend. $100 a barrel is expected to be just around the corner. Remember what happened last time the price of oil got a little out of hand? We had that little recession thing. If oil prices continue to go up, and economic growth remains weak or declines, the Conservatives will increasingly find themselves at risk. Plus, with so many Conservative volunteers already spoken for in battleground Ontario for the fall provincial election, I believe that Harper will bow out early. My prediction: an 80% chance of a spring election, 10% for the fall, and 10% for holding things over to 2012. You heard it here first. I’m predicting a spring federal election outcome of a Conservative Majority government, with a Liberal Opposition, and a slightly increased presence of Bloc legislators. The NDP, I believe, is going to be squeezed out of a few seats in an electoral battle which the media will shape into a contest between Harper and Ignatieff. Despite the NDP’s message on a number of issues finding resonance with Canadians (Afghanistan, for one), their waffling on the long gun registry is going to hurt them, as will the campaign rhetoric flying fast and furiously. This election won’t be about issues, or a vision for Canada. It’s going to be a clash of personalities, and with Ignatieff in the running this time (as opposed to the completely grey Stephane Dion), the media is going to get milk this clash for all its worth. Of course, Ignatieff will be completely outclassed by Harper and the Conservative campaign machine (which will spend the most money ever in the next election), and that’s why I’m predicting a Conservative majority. If it’s to be a fall election, however, I’ll revise my prediction slightly: Conservative minority government. The Green Party, marginalized even more than the NDP, and shut out of participating in the televised leader’s debate, will see its percentage of the national vote share recede to less than 5%, and despite a hard-fought battle in Saanich-Gulf Islands, Green Party leader Elizabeth May can not win that seat. She faces Liberal Party environmentalist Renee Heatherington along with Conservative Cabinet Minister Gary Lunn. Heatherington’s support just isn’t going to collapse enough to allow May to consolidate, and Lunn will emerge victorious. Here in Sudbury and Nickel Belt, NDP Claude Gravelle’s seat is safe in Nickel Belt, while Sudbury NDP Glenn Thibeault’s isn’t. I predict that Sudbury will elect Fred Slade of the Conservative Party to parliament – something unheard of in this union town of ours (and very bold prediction for me to make, I realize). Thibeault is increasingly disliked in this community as a result of his flip-flop on the long gun registry, and as a result of his Party’s stagnation nationally. He might be able to hold on, but with a weak Liberal opponent in Carol Hartman, the anti-NDP vote will coalesce around Slade. Voter turn out in the next federal election will be an all-time low: less than 56% of eligible voters will cast their ballots. Fewer than 38% of those under 25 years of age will vote. Stephen Harper – contrary to popular pundit opinion, I just don’t see Harper going anywhere, even if he can’t secure a majority. He’s been one of the most successful Prime Minister’s Canada has ever had in terms of controlling the legislative agenda. He’s made his Party, and the other Parties, dance to his tune repeatedly. He’s still young, ambitious, and wants to play a larger role on the world stage. He can still fight off any knives which those in his own Party might want to draw against him. Michael Ignatieff – will resign on election night in disgrace, to the joy of his Party. He’ll be replaced on an interim basis by Ralph Goodale. Look for (oh no!) Justin Trudeau to emerge as the leader-in-waiting (or Justin the Unready). Jack Layton – gone by year’s end. Thomas Mulcair will replace him, and will keep the NDP alive. Gilles Duceppe – will make the jump to provincial politics and be the next Premier of Quebec. I have no idea who will replace Duceppe at the federal level. Elizabeth May – despite failing to win her seat or having a Green MP elected anywhere, will easily win a leadership review through a mail-in ballot or online vote of Party members. Less than 30% of members, however, will bother to vote. She will stay on as Leader, and by December, 2011, that might be all she wrote for the Greens nationally. Dalton McGuinty and the Liberals are finished as a government. Ontario voters will turn to Tim Hudak and the Progressive Conservatives, handing them a decent majority in the upcoming October 2011 election. The Liberals will throw some money around over the next 10 months in an effort to woo voters, and a scandal might erupt in Hudak’s own Party due to a putsch by neo-cons in Eastern Ontario, but I just don’t see any way of the Liberals recovering from all of the negative press they’ve received this year. From the HST, to eco-fees, to expense scandals in hospitals and arms-length government agencies, to the G20 (with likely more bad news for the Liberals on its way in the first half of 2011), the Liberals just don’t have much room left for recovery. The best that they can hope for, really, is that Hudak shoots himself in the foot during the campaign, in the same way that previous PC Leader John Tory did. Hudak, though, isn’t going to let that happen, and will run on a platform of saying nothing much about anything. Hudak knows that the provincial election isn’t going to be about him; it’s going to be about Dalton McGuinty. The NDP, under Andrea Horwath, isn’t going to have much of an impact in the next election. Expect a gain of maybe one or two seats. Horwath, who is focussed on bringing good ideas to the table instead of the politics of personality, will prove to be a loser for the NDP. She doesn’t understand that voters don’t have the time for nuanced policy discussions. Check that: she doesn’t understand that the media doesn’t have the time for nuanced policy discussions, and therefore will suffer from the media’s storyline for this next election. And that storyline is going to be Dalton McGuinty’s self-destruction. As for the Green Party of Ontario, despite running some very credible candidates under the leadership of affable Mike Schreiner, the GPO is going to come up short again. Simply put, the GPO will suffer from the same side-lining which the NDP will experience, only for the GPO, a lack of media coverage is going to be a death sentence. One of the biggest problems for the GPO to overcome is finding an issue which resonance for voters and the media. Don’t misunderstand me: I think that the Green Party of Ontario has the absolute best policies for this province. What the GPO doesn’t have, however, is the ability to sell itself. Again, the media doesn’t really care about policies, and the media will influence voters. If the GPO is to have any success, it must find one or two mega-star candidates, and compete with the others through personality politics. Here in Sudbury, Liberal MPP Rick Bartolucci will be returned, although his victory will not be the first announced on election night. Indeed, this is going to be the hardest battle Bartolucci has ever fought. Watch for PC Gerry Labelle to play foil, and a strong NDP candidate to emerge as well. 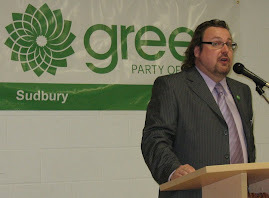 Prospects for the Green Party in Sudbury are good (due to vote splitting) if we nominate the right candidate. Bartolucci’s local popularity, though, will send him back to Toronto. Nickel Belt isn’t even worth writing about. The NDP’s France sGelinas could take a holiday for the four weeks of the campaign and still win. But Frances Gelinas would never think about taking a holiday from anything. Which is why she’ll win easily. The second-biggest winner in the provincial election (after Tim Hudak) will be…Rob Ford. In an effort to woo Toronto voters, we can expect the provincial Liberals to give Mayor Ford just about everything he wants, including tearing up Transit City and agreeing to fund the Sheppard subway expansion to the Scarborough Town Centre. Rather than gaining the Liberals new supporters, however, this will simply alienate Torontonians, and show the rest of the province that the Liberals aren’t above engaging in populist politics when they think it’s to their advantage. Ford will reap the benefits of the Liberal melt-down and will end the year on a personal high note. However, what’s good for Rob Ford isn’t going to be good for Toronto in the long run. I’ve taken a bit of an interest in what’s been going on in BC, because it’s just so damn entertaining. I don’t claim to know all of the personalities involved, or the intricacies and nuances of ballot-box recall questions and whether a three-letter acroynym should count as one word or three. But it’s going to be an interesting year in BC, now that both Premier Gordon Campbell and NDP Opposition Leader Carole James have stepped down. Look for Christy Clark to emerge victorious in BC, and to call that snap election at the end of 2011 (despite the fixed election date law in place), in order to capitalize on the NDP’s just having emerged from their own leadership review. Who the NDP might put forward as leader is anybody’s guess. What about…Carole James? In the bizarre world of BC politics, stranger things have happened. And whither the Green Party of BC? I’ve kind of been hoping that maybe some of those dissident NDPer’s would think about crossing the floor to the BC Greens, but I realize that the dissidents are more likely to consider themselves as the true spear-carriers of the NDP. Maybe when the leadership race concludes, there may be some disaffected dippers who’d consider moving over, but only time will tell. I haven’t been seeing anything about the BC Greens in the media, even in stories about the possible need for a new centrist political party. I guess with all of the shenanigans going on between the Liberals and NDP it’s been difficult to force their way into coverage. However…that’s also just an excuse. The absence of the BC Greens from the political equation in BC at this critical time is just plain bad news for Greens throughout Canada. When all of those climate change denier, neo-conservative, ultra-right-wing Tea Party congresspeople take their seats in January, expect paralysis in the U.S. government. Sure, President Barack Obama has been reaching out to moderate Republicans these past couple of weeks and has found some support for arms limitation treaties and tax cuts. That’s all going to come to a grinding halt, however. Sure, there are some who are saying that the Republicans need to find a way to become something other than the Party of “No”, or they risk alienating centrist supporters. I’m not so sure that they do, however. With the U.S. media firmly in the grip of the right-wing corporate elites, American voters will be told how best to cast their ballots in 2012, and paralysis in the government over the next couple of years will serve the media narrative that an ineffectual liberal Obama just has to go. A more interesting question is just what is the Republican Party going to evolve into over the next year, now that it’s seen such an influx of ultra-right tea partiers? Conventional thinking is that the tea partiers are going to have to either tone it down a little and accept that they can’t have everything that they want, or maybe think about taking themselves out of the Grand Ol Party altogether, and starting something new. I think that those financing the Tea Party know that a new Party just can’t be sustained. So better to continue to work on moderate Republicans from the inside. And I think that’s exactly what’s going to happen. In a few years time, the term “moderate Republican” will likely be as dirty as the word “liberal” in the mouths of the US media. Those who currently self-identify as moderates are going to be pushed to the edges by Republican Tea Partiers and the big money behind the Tea Party movement. Nominations for the presidential election will also begin to heat up in 2011. Will someone challenge Obama from within the Democratic Party? While I think a good case could be made for a challenger to do so, I don’t see it happening. The most credible challenger, Hilary Clinton, is certainly not going to stick her neck out and take herself off of Obama’s team. Better for Clinton that she watches the good ship Obama sink in 2012, and runs for President in 2016. If she does so, I believe that she will become the second female President of the United States. You heard it here first: President Sarah Palin. Watch Palin to emerge as the odds-on favourite of the Republican Party throughout 2011. I don’t think that any other Republican is going to be able to step forward with the kind of financing needed to take her on in a serious way. Palin is all over the US media, and is achieving a cult-like status. When she announces that she’s in the running (which she’ll only do at the last minute, unless she feels that she’s forced), it’s likely going to be game over for anyone else interested in the position. Can she beat Obama in 2012? I think that she can, and that she will. Obama will largely be defeated as a result of self-inflicted wounds, but it will help that Palin has become a media darling, a political super star. Her message of tax cuts and small government will continue to resonate with the media and voters. The Republican Party’s dirty tricks squad might not even have to engage all that heavily for success to come her way (but the Democrat’s only dirty tricks people will be doing everything they can to make stuff stick to Palin). Look for Marco Rubio, newly elected Republican Senator of Florida, to emerge as a potential challenger to Queen Sarah. Bold prediction: the Labour-led government of Australia under Prime Minister Julia Gillard will fall in late 2011. Gillard is tasked with holding together a coalition primarily composed of Labour parliamentarians, with one Green and a few independents along for the ride. Expect the Greens in Australia to start thinking that they should be driving the Labour bus, which is going to ultimately lead to the desertion of one or several of the independents (or even a Labour MP). Since Gillard’s coalition is poised on a knife’s edge anyway, the whole thing is going to come tumbling down. The new election will see Julia Gillard returned as Prime Minister with a stronger mandate, and no need for coalition partners. The Greens will gain seats, but not many. That’s all for today. Stay tuned for Part 2. I agree with you analysis for the Green Party of Canada Steve, unfortunately. But, I hope if your prediction of a loss for Elizabeth May in SGI and an overall reduction in national support for the Greens is accurate, Ms. May will realize that her message is not reasonating and will do the right thing and resign as leader, so the GPC can run a leadership contest that will renew and re-energize the party. She's tried her best, but it is time for the Green Party to open up its messaging so that it can reach and appeal to the greatest number of Canadian voters. Unfortuately, she's proven that it is not possible with an environmental activist at the helm, however counter intuitive that may seem. On the provincial level, I would not write of McGuinty so quickly. I believe he can return with a smaller majority or a minority, and will shed centrist votes that won't be happy with hard-left Horwath or hard-right Hudak and thus could go Green instead, raising or at least maintaining the Green vote share. Federally I believe SGI can be won by May, and that the GPC can and will increase their vote share. But in the event that May loses SGI and vote share drops, I expect she would step aside as leader and seek a role where she feels more effective. Do you believe my running in SGI BC will effect that out come ? I cant pass up an opportunity for a safe prediction. I predict shavluk will bring out some new voters in SGI. But the numbers will be too small to judge if that is true. @James: I don't think that May is going to go anywhere, even if she loses SGI. Recall that May was reluctantly drafted by the Party (or so the storyline goes) to run in B.C. after internal polling identified SGI as the best riding in the country for her to run in. May had always maintained that she was quite happy to stay in Nova Scotia. I don't think she's ever been 100% on board with the Party's wishes to move her to B.C., although I know that she's been campaigning her guts out ever since moving to the west coast and making her new home there. What happened this past summer, though, with changes made to the Party's by-laws to do away with a mandated Leadership contest, and replacing it with some sort of "review" of performance 6 months after an election, all but assures that if May wants to stay on as Leader, she'll stay on. Given that most Party members are disengaged from the Party's internal processes, we can expect a very low proportion of members to cast ballots in a "review", and after the emails go out from Central Party urging members to confirm May as the Leader, we can expect most votes will be in her favour. Unless May steps down, there will be no change in Leadership, due to the changes the membership made to our own internal processes for selecting a leader. @Erich: I hope that you're right about the GPO. I'm a big fan of Mike Schreiner. And I do believe that voters might have some issues with Hudak and Horwath. But I don't think that those issues are going to be enough to hold Hudak back. If anything, a stronger Horwath (and a stronger showing by the Greens) could potentially be in Hudak's favour, given our archaic first-past-the-post electoral system here in Ontario. I really don't expect Hudak to say very much in terms of policy, and that's going to be a big asset for him. McGuinty has to run on his record, and that's just going to be a big flop with voters. If the GPO is going to make any inroads, it's going to have to be on nuclear energy (unless we have something completely different on offer on the education file, and I just don't know what's up with that). Nuclear energy alone, however, isn't likely going to carry the day, as it won't fit the mainstream media narrative (well, maybe for a day or two it will, but generally that narrative is going to be about a surging Hudak and collapsing McGuinty...policy will play a back seat). Make do for now with the thoughts of an orange? mer quintessential orange country even. I would be very surprised if May wants to ramin Leader when and if she fails in SGI. So much so that it hardly thught about what if she wanted to stay? I think you are right that she probaly can stay, without even having to mount a big fight. And for what it is worth, I dont think there will be an election in the Spring. Though I wouldnt place very high odds on that. And if there is not, it will about 80% likelihood not be until October 2012. I do agree there will be a spring election. However, I don't think that it will be because the budget will be voted down. I think the Conservatives will pre-empt them all, and call an election in late March or early April, before the budget even gets voted on. I think the chances of the Conservatives won't get a majority government (if they do, it will be tenuous, 2-5 seats at most). There might be some gains by the Liberals at the expense of the NDP, but I don't think they are in any position to gain more than 10 seats at the moment. Once the Conservatives return to power, minority or not, they will look forward to probably two years of unfettered rule, as I'm sure the Liberals and NDP will have leadership campaigns, and it will take a while for them to fund-raise. As for the SGI race, I think you put too much stock in Renee Hetherington. She has a pretty strong personality, which can be off-putting. Though this could just be my own personal opinion based purely on professional encounters. Lunn will get in, based purely on incumbency. You'd be surprised how many people love that guy. I think you are right, if the Greens don't gain any seats in the next election, you have to start wondering if there is any point in continuing. I'll admit that I did not renew my membership (I felt inappropriate to belong to a political party while I live abroad), and I have no idea if I will rejoin if I return to Canada. In this mess of a weak ruling party and even weaker opposition, the fact that the Greens cannot make inroads is very disappointing. As for Sarah Palin, I don't seriously believe the Republicans would let her have the Presidential nomination. If anything, I see her running as an independent. Even though people are not really liking what is going on right now, I think things are starting to swing in Obama's favour, and probably by 2012, he will have enough support to make a successful bid. I can't comment on provincial politics. Technically, I can vote in the Manitoba election next year, but I have been away from the province for so long, I don't know much about the dynamics. I think the NDP have stagnated without Gary Doer, but it isn't like the Progressive Conservatives have much of a way to make inroads. My prediction is a reduced NDP majority. There is no way that Winnipeg is going to have both a conservative mayor (Sam Katz) and a conservative provincial government. As for Australia. As you know, I live in Australia. However, despite the minority government, things are far more mundane here. The independents, despite being former National Party members, are probably more left wing than Labour. In fact, it was one of the former Nationals who was pushing for the legalization of gay marriage. Anyways, Gillard is basically the equivalent of Jean Chretien, while Abbott is the equivalent of Stockwell Day. Despite high polling numbers by the Coalition, I doubt that there will be an election anytime soon. The only chance of it happening is before the turnover of the Senate in July, when the numbers of Coalition senators drops, and the Greens take the balance of power. If anything is going to cause an election, it is things being held up in the senate. If Gillard sees the opportunity, she might decide to do a double dissolution, and have full senate elections (rather than half), and see if she can make the advantage in a large campaign. I think Abbott's popularity will wane, as he has already proven himself to make Stockwell-esce messups. Really, though, it is the middle of summer, so it might be a while before politics start heating up again here. I do think it is much like Ontario, though, where the provincial government goes one way (ie the Liberals now) provincially, and the opposite way federally. Right now, the Coalition has taken a couple of the states that had long lived Labor governments, so I think that federally it will stay Labor.